The Winnebago Man video is the granddaddy of all viral. Foul-mouthed, vitriolic outtakes from a real promotional shoot starring an RV salesman named Jack Rebney, it circulated underground on VHS tapes in the 1990s, before YouTube turned “the angriest man in the world” into a phenomenon. Spike Jonze is rumored to have sent out copies of the video as Christmas gifts; Conan O’Brien named it as one of his all-time favorites; and Larry David cited Rebney as inspiration for Curb Your Enthusiam. Documentary director Ben Steinbauer found Rebney not just hilarious but sympathetic and relatable. (One wonders what Steinbauer’s outtakes might look like.) He found Rebney living alone in the woods, unwilling to talk about how he got there, and unaware of his fame among the millions. What good American doesn’t want to get famous for doing nothing much? But who wants to be remembered for such a low, low moment? In Winnebago Man, Rebney struggles to choose between privacy and celebrity; now he has embraced the role of anti-star for the digital age, and is making the talk show rounds. The film is a surprisingly moving exploration of one man’s 15 minutes; it’s in select theaters this summer. One of the highlights of new releases in poetry this fall is a long poem by John Shade that begins with the remarkable line “I was the shadow of the waxwing slain.” It’s all the more remarkable because John Shade does not exist. Shade is a creation of Vladimir Nabokov, and his 999-line poem is the start of Nabokov’s 1962 novel Pale Fire. Shade has (in the novel) died, and the balance of Pale Fire is taken up with commentary on the poem by his friend, Charles Kinbote. But Kinbote is obviously off his rocker, and he has something to get off his chest. Did he murder John Shade? Is he John Shade? Nabokov scholars have spent almost 50 years debating the fictional relationship. An author never had more fun playing with his audience. Now, Slate reports that the small poetry press Gingko is publishing the fictional poem (also called “Pale Fire”) –- that is, about one-quarter of Pale Fire — under the name John Shade. This with the blessing of Nabokov’s son, Dmitri, who caused a stir last year with the posthumous release of his father’s novel The Original of Laura, which Vladimir had ordered to be incinerated. This edition of “Pale Fire” –- the poem –- will include commentary from a Nabokov scholar, Brian Boyd. Take a moment to appreciate the meta-mess: Nabokov’s Pale Fire is about a completely deranged attempt at interpreting a poem. Now, a real scholar will interpret that same poem. It’s as though Nabokov had the whole thing planned all along. Matt Schickele is a tragically underrated songwriter who has put out a handful of solo records of piercing strangeness and beauty. Delicate and jagged, Schickele’s harmonies constantly edge toward the dissonant while staying just this side of earworm. On The Badger Game, he sings over perfectly realized small chamber arrangements, but there’s nothing trendy about it. Son of the composer and educator Peter Schickele, Matt comes to his classical eclecticism by birthright, and he has composed an opera (in progress), a large number of published bagpipe tunes, and music in many other genres. Fans of Sufjan Stevens and Andrew Bird should all take note: this record bears repeated — obsessively repeated — listening. Over the last few days, the internet has ooed and aahed over a viral marketing campaign from Old Spice. In just two days, a production team and a charming actor named Isaiah Mustafa created 183 short videos; instead of paying for TV airtime, Old Spice simply uploaded them to YouTube. It was the kind of bombshell that the creative minds at Sterling Cooper could only dream of. 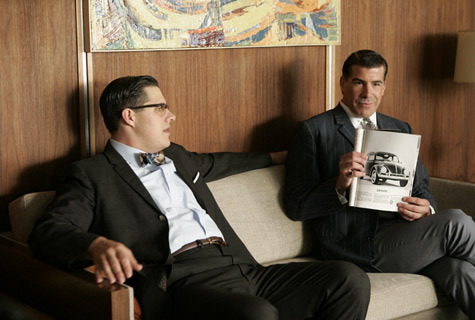 The fictional ad agency at the center of Mad Men, Sterling Cooper is late to the game on a lot of ideas. The show’s writers often appropriate real advertising campaigns of the 60s for their plot lines. 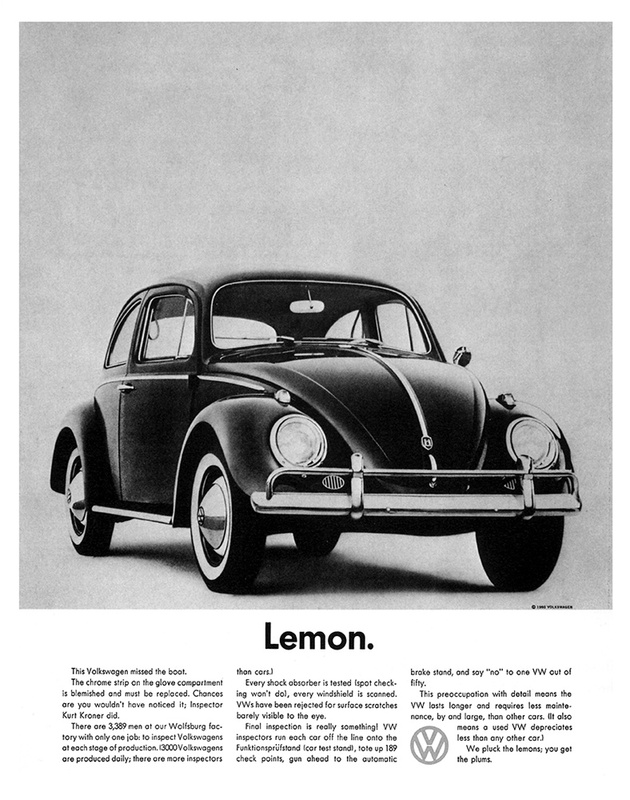 In an early episode, creative director Don Draper opens up a magazine to the iconic Volkswagen “Lemon” ad; Maidenform’s racy bra campaigns push them to propose a sexier set of ads to their client, the more conservative Playtex. The last season ended in November 1963, so I’d bet money that this season uses the famous “Daisy” ad from Lyndon B. Johnson’s 1964 campaign, which startled the nation by linking Barry Goldwater to nuclear war. (It was yanked from the airwaves, but replayed often on news outlets; you can see 1964 ads from both candidates at the Museum of the Moving Image’s website.) “Daisy” was designed by Doyle Dan Bernbach, a firm that Mad Men’s writers have already co-opted as one of Sterling Cooper’s competitors. And Mad Men has itself become the subject of real-life ad campaigns. Banana Republic and Brooks Brothers have both used Mad Men to entice men to make like dapper Draper and his boss, the slick Roger Sterling. Last fall, Studio 360’s Eric Molinsky explored the Draper fetish among American slobs, and you can hear it here. The first-ever disco song, the one that spawned the entire American craze, made its debut in the Top 40 this week in 1973. Only, back then, it wasn’t yet disco. In fact, it wasn’t even American. The song was “Soul Makossa,” and most music historians credit its popularity with disco’s inception. It comes from the afrobeat record of the same name by Cameroonian musician Manu Dibango. “Soul Makossa” may not instantly ring a bell, but I promise that you’ve heard it a million times. The iconic chant “Mama-ko Mama-sa Mama-ko-sa” has been quoted by artists like Michael Jackson, A Tribe Called Quest, and even Rihanna. The 1970s might have sounded very different had DJ David Mancuso not stumbled upon the track in a Brooklyn music shop in 1973. Mancuso torched dance floors with every spin of the record, and its popularity in night clubs caused the rare disc to sell out across New York City. Thus, disco was born. And it’s easy to hear the roots of disco in Dibango’s song: dense percussion, thick bass, incessant groove, it’s all there. And as someone who wasn’t alive to enjoy the 1970s firsthand, it totally explains the origins of the genre to me. Disco always felt like an alien artifact that came out of nowhere – there always seemed to be a break between the more raw rock and soul of the ’60s and the lush dance ornamentation of the ’70s which time and Gloria Gaynor didn’t explain. Apparently the answer, as with most questions of origin in American pop music, is that we took our cues from Africa. You wouldn’t guess that Infra, an ambient-classical piece by Max Richter, was originally conceived as a score for Britain’s Royal Ballet; nothing about it screams “dance” to me. While the music leaves the choreography to our imagination, it translates into an album quite nicely. Richter contrasts melodic chamber arrangements with subtle swaths of static and electric ripples. Yet the colors don’t clash: on record they gel to suggest a painting, rather than a dance. Be careful what you wish for. New York’s MoMA thought it had commissioned a group of artists and architects to create a farm in the courtyard of it’s Queens outpost, P.S.1. And on opening day they didn’t disappoint. Surprise! 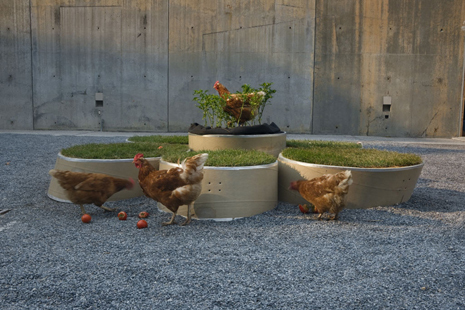 Unbeknownst to MoMA, a “tool shed” the architects were building was actually a chicken coop. On the day of the opening they smuggled in six chickens and a dozen chirping chicks. But all chickens aside, P.F.1 (Public Farm 1) was a very impressive achievement. This urban farm supported more than 30 varieties of vegetables, herbs, and flowers — it also included a solar-powered phone-charging station and even a juicer for fresh veggie cocktails. A project this ambitious took a team of architects, farmers, politicians, artists, and scientists several months to put together. The video below (by architecture partners WORK) gives you a sense of the logistics required for a project of this scale. The team’s efforts are chronicled in Above the Pavement – The Farm! P.F.1 reminded me of another outrageously ambitious urban farm project: “Wheatfield – a Confrontation“. In the summer of 1982, a flourishing field of wheat sprung up in a vacant lot near the World Trade Center. It was the work of ecological artist Agnes Denes. It took two assistants and a bunch of volunteers to help her remove trash from the land, spread truckloads of topsoil, and plant nearly two acres of wheat. The result: a beautiful field of golden wheat planted among the sleek steel skyscrapers of downtown Manhattan. After harvesting, the hay was fed to the horses stabled by the New York City Police department and the grain traveled around the world as part of an art exhibition organized by the Minnesota Museum of Art. Dene’s art and efforts like the P.F.1 project prove that we can use our cities as laboratories for experimentation, and that even the most impossibly utopian visions of green city living may be within our reach.